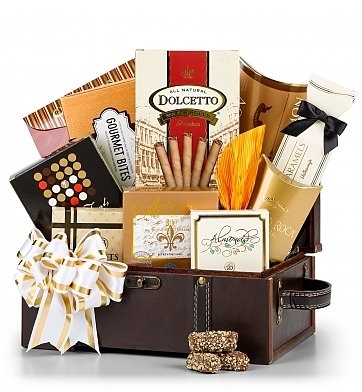 Express your best business wishes with this memorable gift of tasty treasures and treats. A treasure to behold, this bestselling gift brings together gourmet foods with world-renowned brands to bring you the highest quality available, including Smoked Salmon, Wine Companion Crackers, Candied Berries, Fresh Almonds, Pecan Nougat Caramels, Dolcetto Wafer Rolls, and more. All this and more is packaged elegantly in a beautiful leather-detailed keepsake chest with brass rivets, secure handles, sturdy metal hinges and a solid brass clasp. A top-selling gift for ten years and garnering the highest customer reviews year after year, it's the perfect gift for any special occasion.